*Disclosure: This post is part of my ongoing relationship with the folks from California Endive Farms. I receive complementary boxes of endive and I am being compensated to develop recipes to share with you; all opinions expressed here are 100% mine. Since partnering up with California Endive Farms last year, I have enjoyed more than my fair share of endive. I love having a constant supply in the refrigerator, especially in the winter and early spring when my own garden is sleeping. I have showcased a few different cooked endive recipes here on the blog (such as this one and this one), but I also really love endive raw. It is great in salads (like this and this), and the leaves are the perfect receptacle for filling with all sorts of delicious and healthy dips. 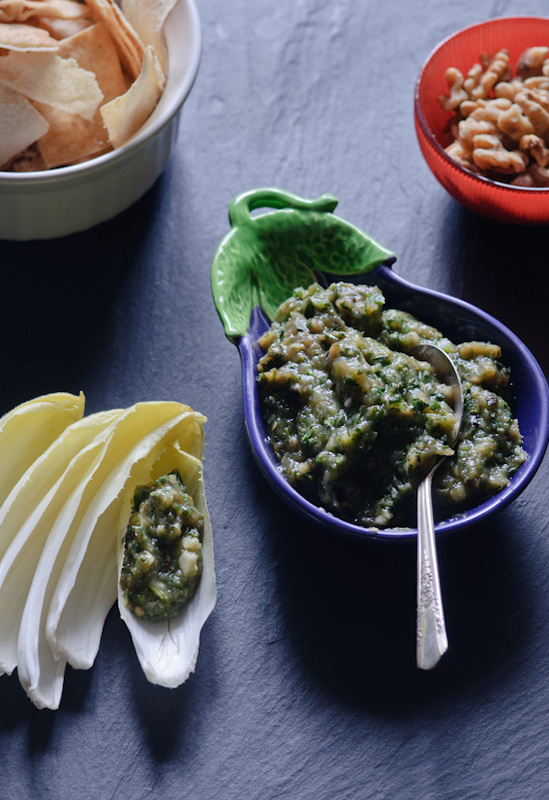 This Grilled Eggplant and Cilantro dip was inspired by the recipe for Charred Eggplant with Chile Sauce and Tahini that I found in the May 2013 issue of Saveur magazine. It’s incredibly easy to make and it’s tasty as part of an appetizer spread (shown here with endive leaves, pita chips, and some walnuts). It’s also great in place of more typical condiments in a sandwich. 1. Grill eggplants over high heat until charred and tender, 8-10 minutes. (Turn the eggplants over half way through the cooking time). Allow the eggplants to cool, then peel and compost (or discard) the skin. Roughly chop the eggplants. 2. In a food processor or blender, purée the eggplant along with the cilantro, garlic, chile, olive oil, and honey. Feel free to leave the dip a bit chunky (or make it smooth, if you prefer). Taste and add sea salt to your liking. Serve with endive slices, vegetable crudités, and/or sliced pita bread or pita chips. Adapted from this recipe in Saveur magazine. Oh Winnie, this looks absolutely delicious! I can snack on this all day! 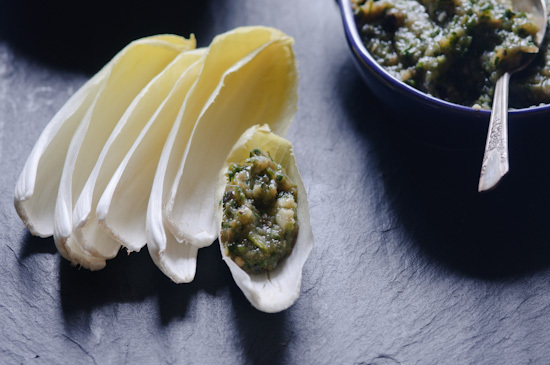 This dip sounds so great, especially in endive leaves! OM NOM NOM. Yeah, the endive leaves are simply the perfect dipper! We LOVE using endive as a dipper! Fabulous idea, Winnie! I am so glad you like the recipe, Molly! I love grilled eggplant, this dip sounds fabulous!